Volleyball is an Olympic team sport in which two teams of 6 active players are separated by a net. Each team tries to score points against one another by grounding a ball on the other team's court under organized rules. The complete rules of volleyball are extensive, and points are awarded as follows: If the ball touches the ground outside the court area, the team which made contact with it last loses the point. If the ball touches the ground on team A's side of the net, team B is awarded a point, and vice-versa. The ball must be hit over the net to get a point.The team who wins the point then serves. The first team to reach 25 points wins the set and the first team to win three sets wins the match. Teams can contact the ball only three times before the ball crosses the net, and consecutive contacts must be made by different players. The ball is usually played with the hands or arms, but players can legally strike or push (short contact) the ball with any part of the body. Through time, volleyball has developed to involve common techniques of spiking, passing, blocking, and setting, as well as specialized player positions and offensive and defensive structures. Because many plays are made above the top of the net, vertical jumping is an athletic skill emphasised in volleyball. This article focuses on competitive indoor volleyball, which is carefully regulated and played indoors. Numerous variations of volleyball have developed for casual play, including the Olympic spin-off sport beach volleyball. On February 9, 1895, in Holyoke, Massachusetts (USA), William G Morgan, a YMCA physical education director, created a new game called Mintonette as a pastime to be played preferably indoors and by any number of players. The game took some of its characteristics from tennis and handball. Another indoor sport, basketball, was catching on in the area, having been invented just ten miles (sixteen kilometers) away in the city of Springfield, Massachusetts, only four years before. Mintonette (as volleyball was then known) was designed to be an indoor sport less rough than basketball for older members of the YMCA, while still requiring a bit of athletic effort. The first official ball used in volleyball is disputed; some sources say that Spalding created the first official ball in 1896, while others claim it was created in 1900. The rules have evolved over time; by 1916, the skill and power of the set and spike had been introduced, and four years later a "three hits" rule and back row hitting guidelines were established. In 1917, the game was changed from 21 to 15 points. In 1919, about 16,000 volleyballs were distributed by the American Expeditionary Forces to their troops and allies, which sparked the growth of volleyball in new countries. At the 1988 Games, Karch Kiraly and Steve Timmons led the U.S. men's team to a second straight gold medal. In 1992, underrated Brazil upset favourites C.I.S., Netherlands, and Italy in the men's competition for the country's first Olympic gold medal. Runner-up Netherlands, men's silver medalist in 1992, came back under team leaders Ron Zwerver and Olof van der Meulen in the 1996 Games for a five-set win over Italy. A men's bronze medalist in 1996, Serbia and Montenegro (playing in 1996 and 2000 as the Federal Republic of Yugoslavia) beat Russia in the gold medal match in 2000, winning their first gold medal ever. In 2004, Brazil won its second men's volleyball gold medal beating Italy in the finals. In the 2008 Games, the USA beat Brazil in the men's volleyball final. 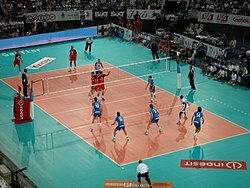 The game is played on a volleyball court 18 meters long and 9 meters wide, divided into two 9 m × 9 m halves by a one-meter wide net placed so that the top of the net is 2.43 meters above the center of the court for men's competition, and 2.24 meters for women's competition (these heights are varied for veterans and junior competitions). Each team consists of six players. To get play started, a team is chosen to serve by coin toss. A player from the serving team (generally accepted to have the advantage inplay) throws the ball into the air and attempts to hit the ball so it passes over the net on a course such that it will land in the opposing team's court (the serve). The opposing team must use a combination of no more than three contacts with the volleyball to return the ball to the opponent's side of the net. These contacts usually consist first of the bump or pass so that the ball's trajectory is aimed towards the player designated as the setter; second of the set (usually an over-hand pass using wrists to push finger-tips at the ball) by the setter so that the ball's trajectory is aimed towards a spot where one of the players designated as an attacker can hit it, and third by the attacker who spikes (jumping, raising one arm above the head and hitting the ball so it will move quickly down to the ground on the opponent's court) to return the ball over the net. The team with possession of the ball that is trying to attack the ball as described is said to be on offense. The game continues in this manner, rallying back and forth, until the ball touches the court within the boundaries or until an error is made. The most frequent errors that are made are either to fail to return the ball over the net within the allowed three touches, or to cause the ball to land outside the court. Other common errors include a player touching the ball twice in succession, a player "lifting" the ball, a player touching the net while attempting to play the ball, or a player penetrating under the net into the opponent's court. There are a large number of other errors specified in the rules, although most of them are infrequent occurrences. These errors include back-row or libero players spiking the ball or blocking (back-row players may spike the ball if they jump from behind the attack line), players not being in the correct position when the ball is served, taking more than 8 seconds to serve or playing the ball when it is above the opponent's court. In 2008, the NCAA changed the minimum number of points needed to win any of the first four sets from 30 to 25. If a fifth (deciding) set is reached, the minimum required score remains at 15. In addition, the word "game" is now referred to as "set". Top Spin: an overhand serve where the ball gains topspin through wrist snapping. This spin causes the ball to drop faster than it appears to a passer receiving it. Jump Float: This is a serve like the jump serve and the floater. The ball is tossed lower than a topspin jump serve, but contact is still made while in the air. This serve is becoming more popular amongst college and professional players because it has a certain unpredictability in its flight pattern. As with passing, one may distinguish between an overhand and a bump set. Since the former allows for more control over the speed and direction of the ball, the bump is used only when the ball is so low it cannot be properly handled with fingertips, or in beach volleyball where rules regulating overhand setting are more stringent. In the case of a set, one also speaks of a front or back set, meaning whether the ball is passed in the direction the setter is facing or behind the setter. There is also a jump set that is used when the ball is too close to the net. In this case the setter usually jumps off his or her right foot straight up to avoid going into the net. The setter usually stands about ? of the way from the left to the right of the net and faces the left (the larger portion of net that he or she can see). Kill- when someone scores a point and touches the ball. Liberos are defensive players who are responsible for receiving the attack or serve. They are usually the players on the court with the quickest reaction time and best passing skills. Libero means 'free' as they have the ability to substitute for any other player on the court during each play. They do not necessarily need to be tall, as they never play at the net, which allows shorter players with strong passing and defensive skills to excel in the position and play an important role in the team's success. A player designated as a libero for a match may not play other roles during that match. Liberos wear a different color jersey than their teammates. Outside hitters or Left side hitters attack from near the left antenna. The outside hitter is usually the most consistent hitter on the team and gets the most sets. In accurate first passes usually result in a set to the outside hitter rather than middle or opposite. Since most sets to the outside are high, the outside hitter may take a longer approach, always starting from outside the court sideline. In non-beginners play, there are again two outside hitters on every team in every match. Opposite hitters or Right side hitters carry the defensive workload for a volleyball team in the front row. Their primary responsibilities are to put up a well formed block against the opponents Outside Hitters and serve as a backup setter. Sets to the opposite usually go to the right side of the antennae. Prisoner Ball - also played with volleyball court and a volleyball. People can be called out, back in. Footvolley - a sport from Brazil in which the hands and arms are not used but most else is like beach volleyball. ^ "Volleyball". International Olympic Committee. Retrieved on 2007-03-21. ^ "Volleyball". International Olympic Committee. Retrieved on 2007-06-13. ^ a b "The Volleyball Story". Fédération Internationale de Volleyball (FIVB). Retrieved on 2007-09-21. ^ a b "How Volleyball Began". Northern California Volleyball Association. Retrieved on 2007-09-21. ^ a b c d e "History Of Volleyball". Volleyball World Wide. Retrieved on 2007-09-21. ^ "History of Volleyball". SportsKnowHow.com. Retrieved on 2007-09-21. ^ "History of Volleyball". volleyball.com. Retrieved on 2007-09-21. ^ a b c "FIVB History". Fédération Internationale de Volleyball. Retrieved on 2007-09-21. ^ "Chronological Highlights". FIVB. Retrieved on 2007-01-30. "1924: The Olympic Games in Paris. The programme included a demonstration of "American" sports, and Volleyball was among these." ^ "Section 1.1" (PDF). Official Volleyball Rules 2005. FIVB. 2005. http://www.fivb.org/EN/Volleyball/Rules/FIVB.2005.VB.RulesOfTheGame.Eng-Fre.pdf. Retrieved on 2 October 2006. "The playing court is [...] surrounded by a free zone which is a minimum of 3 m wide on all sides.". ^ "Section 3.1" (PDF). Official Volleyball Rules 2005. FIVB. 2005. http://www.fivb.org/EN/Volleyball/Rules/FIVB.2005.VB.RulesOfTheGame.Eng-Fre.pdf. Retrieved on 2 October 2006. "STANDARDS The ball shall be spherical ...". ^ "Section 12.4.4" (PDF). Official Volleyball Rules 2005. FIVB. 2005. http://www.fivb.org/EN/Volleyball/Rules/FIVB.2005.VB.RulesOfTheGame.Eng-Fre.pdf. Retrieved on 12 September 2006. "The server must hit the ball within 8 seconds after the first referee whistles for service.". ^ a b "2008 Major Rules-Change Proposals". ncaa.org. National Collegiate Athletic Association (2008-07-14). Retrieved on 2008-10-12. ^ Pettit, Terry; and Potts, Kerri (2002-02-28). "Rules changes for the 2002 season". NCAA Women's Volleyball Rules Committee. Retrieved on 2007-01-12. "The NCAA Women's Volleyball Rules Committee [...] approved several rules changes for the 2002 women's volleyball season including the use of the libero player"
^ "Volleyball glossary". Cambridge University Volleyball Club. Retrieved on 2007-03-20.